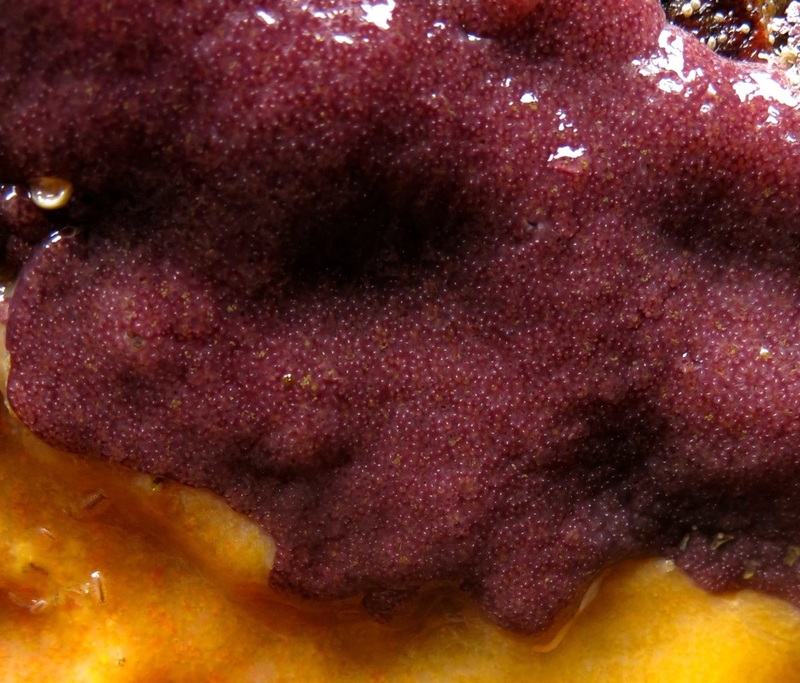 A speckled compound tunicate colony (purplish) next to an unknown ascidian species. Photo by Jenn Burt. This recently described ascidian species forms smooth, usually dark reddish-brown (with some variation) colonies, with many small holes (siphons) and a few larger holes. Colonies can be up to 2 cm thick and vary in shape and size; the largest colony in the original species description measured 8 cm across. See the original description by Lambert (2003) for further identification information on this relatively unknown species. The recorded distribution for this subtidal species is the coastlines of BC and Washington. Specimens from the original description were found growing on bivalves, docks, and rope, from less than 1 m up to 80 m deep. Lambert, G. (2003). New records of ascidians from the NE Pacific: a new species of Trididemnum, range extension and redescription of Aplidiopsis pannosum (ritter, 1899) including its larva, and several non-indigenous species. Zoosystema. 25(4): 665-679.